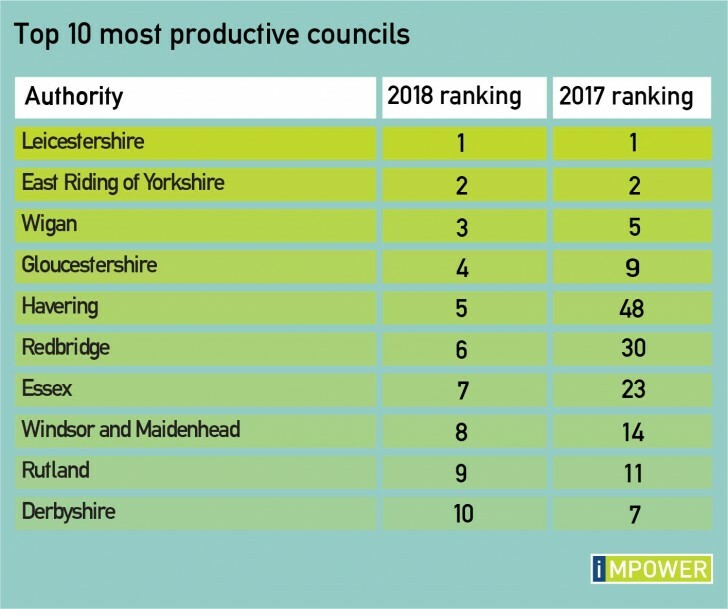 It’s that time of year again – the eagerly anticipated release of our list of the most productive councils in England. This year’s list is being published as part of our latest report, ‘Which Councils Are Best?’, which advocates for the introduction of a productivity approach in local government. The focus of discussions around council funding is usually on the amount of money that councils receive, but we strongly feel that this means leaders are not focusing sufficiently on how the money is best spent. A productivity approach measures performance against outcomes, per pound invested. Ranking councils’ productivity would help them improve decision making, therefore getting better results from whatever money is available to them and reducing unnecessary budget pressures. Using the IMPOWER INDEX, we measure productivity through six different lenses: children’s social care; older people; all age disability; health and social care interface; housing and homelessness; and waste and recycling. This enables us to organise each of the 150 councils into a league table, and see at a glance which councils are spending their money most effectively and getting the best outcomes for citizens. Adopting a productivity approach would also have other benefits for local authorities. It would provide an incentive to learn from the best councils and to engage in healthy competition to be ‘the best’. It would also assist the sector to articulate what ‘good’ services look like. By defining the standard of outcomes it is striving for, and identifying which investments give the best possible trade-off between spending and outcome improvement, the sector would be better able to fight against funding cuts. Leicestershire and East Riding of Yorkshire retain their 2017 positions as the most productive councils in England. Wigan, Gloucestershire and Derbyshire have also stayed in the Top 10. There are also five newcomers in the list, with Havering and Redbridge having made the most progress to claim their spot. Congratulations to all. For more information on council productivity – and to see additional Top 10 ranking tables for a) productivity across the six lenses, and b) the most improved councils, download the report.